Ah Edinburgh in August, is a bit mental to say the least, don't get me wrong I love it the festival and all it brings, and probably more so this year as I'm not commuting to work through all the festival buzz. There's no denying that Edinburgh is a hive of activity, there is literally something for everyone to do, this year I wanted to make a conscious effort to get to more shows and little festivals as although I was through lots during the festival last year I didn't make it to any actual shows! 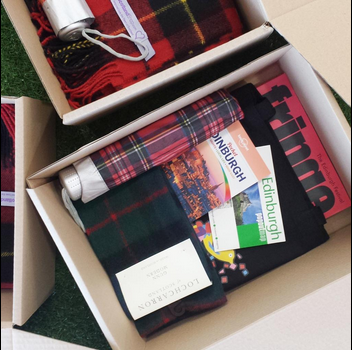 I was lucky enough to be sent a #StressFreeFringe kit from the lovely folks at Zeal Media and StressFreePrint complete with a locals guide to Edinburgh, Fringe brochure, tote bag, tartan brolly and tartan scarf, they helped me prepare for anything the Fringe could throw at me (Well almost!) Perhaps not the booty shaking at one of the shows I was forced to demonstrate, eek! StressFreePrint's #StressFreeFringe campaign aims to help bloggers take the unnecessary stresses out of their Fringe experience, a pretty nifty idea if you ask me! OOTD; clearly colour wasn't in the order of the day that day. P.S The tartan scarf from my #stressfreefringe kit came in handy as it was freezing! I'd roughly planned a few shows for us to see, all part of Freestival as we figured we'd see what ticketed shows we fancied seeing on the day, as it turns out we only went to free shows (and tipped accordingly of course!) but had a fab time watching a wide variety of performers! First up was Ellie Taylor of Snog, Marry, Avoid fame amongst others, I'm a big fan of trashy telly and have a real soft spot for this show, POD would hate me! I first saw Ellie's show in the Fringe brochure and knew instantly it was a personal must see, I think she is hilarious and definitely wanted to check her show out, as it were her show did really well, I'm talking rave reviews and shows where more people were turned away than could fit in the room, impressive right?! After a tweet from Ellie herself encouraging us to head along early we did just that (not that early though...) as we were actually the very last two people accepted into the show and had to sit on the floor with a few other people, well worth it though! There was definitely a recurring theme in all my early 'starred' Fringe shows (read: shows I circled in the brochure) in that much of the content/themes were about feminism, I feel this year has definitely been a year in which so many more people are standing up and speaking about what it is to be a feminist on a much bigger scale, from the blog world to the world of comedy, it is simply amazing! Politics aside, Ellie's take on feminism and the trials of waiting to get engaged were hilarious, I would've said falling of my seat funny, but sitting on the floor and all. A definite one to watch! Finally got my mitts on some Mademoiselle Macarons, yum! We spent our afternoon having a wee wander round the shops, buying all the things in Paperchase (I swear I have a problem), eating macarons and a cute wee dinner at Bella Italia, before heading to our next show of the day. Another pre-planned show on my behalf I fancied heading along to InCahoots; 'Some Like it Hoots' as I'd previously seen Paul and Luke doing improv' with Shoot from the Hip at a random comedy club in London, my friend and I hadn't planned to go but had an amazing night and they were so funny! Loughlan and I headed along and again luck was on our side as we arrived just in the nick of time and though we had to stand, we weren't disappointed! Fans of sketch comedy take note, Paul and Luke work so well together and had us laughing at certain points we probably were supposed to laugh at, their comic chemistry is on point and I would without a doubt go and see them again! After a few drinks we decided to round our night off watching another free show and something totally different, we'd had stand up, sketches and now it was time for a bit of character comedy (I hope that's the correct term) we headed off to see Billie Was Dancing with the Seagulls, the brainchild of Katie O'Brien and easily the oddest show we saw all day! If I'm honest I'd rate this show lowest out of the three we saw perhaps led by how good the other two were?! The show was dark and uncomfortable at times, but did have us laughing uncontrollably at some points (just not as much as we'd hoped.) I'd be interested to see Katie perform in the future as I think her show needs a bit of refining and working out the direction it wants to go in as it was at times a little confused, nonetheless it was interesting seeing a show which was so different to anything I've seen before, after all life would be boring if everything was the same! Can't quite say I enjoyed being forced on stage to shake my bum with other audience members though, eek! Once again thanks to Zeal Media for kitting me out and ensuring I had a stress free day at the Fringe, I'm already looking forward to next years festival and checking out more shows! I'd love to hear if you checked out many Free Fringe Shows and what you thought?/What your Fringe 2014 highlights were?